Less Ash angst, more pokémon battles. Can that be a bad thing? On a lonely Monday night I made a pilgramage to my area theater for a showing of Pokémon 3: The Movie to accomplish two things; to keep up my traditional review of the Pokémon movies and to secretly fill my desire to see a film filled with cute monsters that say nothing but derivatives of their names. Anyway, the theater was hot and sticky and not to rag on the nice, spacious theater, but it smelled like someone had let a possum rot under a seat or something. So, smell aside, I propped myself up and observed the crowd... all three of ‘em. You know, for some reason I get this weird feeling that people think I'm strange for watching Pokémon. Not because I'm 20 and watching Pokémon, but because I jot down notes on folded sheets of paper throughout the movies I review. Whatever the reason, I'm an Otaku. And it is my duty to do the abnormal all in the name of fandom. Long live the Otaku! Sorry... force of habbit. Now that I got that out of my system, first things first, I've got to say I really enjoyed this movie. I felt it was much closer to the feel of the series all the while keeping with the grand scope that the previous movies sported. The new human and animal characters introduced are much more likeable and I found myself actually caring for them in the end. Not to mention the fact that Misty and Brock actually play a very active role throughout the movie which makes for some very cool pokémon battles. And lets me not forget to mention that the pokémon battles are an integral part for how the movie advances to it's climax, unlike in the past two movies where true pokémon battles have been few and far between. Oh, yeah, Team Rocket's part in the movie is not as intrusive as it has been in the past movies. Which is kind of good because they are as over used as Tuxedo Mask is in Sailor Moon. 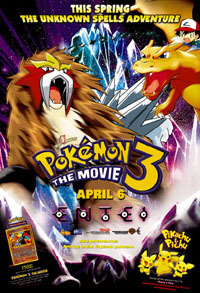 In fact, Jessie, James, and Meowth are used as a liaison between the characters and the viewer in this film and make a number of hilarious references to the roles they play in the movie as well as the series. Ok, it's time for the nitty gritty stuff. For the first time ever, the Pikachu lead-in story, this time simply titled Pikachu and Pichu, didn't totally turn my brain into mush. Sure, the short still has that ‘Who's That Pokémon' feel to it, but this lead-in is built like it could have been an episode of the series if it just had a few more words. Which is a good thing because it's got a clear tie-in to the series which I won't spoil for any pokéfans. Here's the skinny, the short opens with the crew in an elevator in a big city. They meet up with Brock and they let their pokémon out of their pokéballs so they can ‘hang out' until 6 PM while they go get some stuff done. Enter a pair of pichu brothers. Pikachu follows them and ends up having an adventure through the big city that's a lot like Oliver and Company without the singing, that is until there's a big pokémon musical number that rivals the one in Pikachu's Rescue Adventure from the second movie all because of the simple fact that the number features some of the coolest Gold and Silver pokémon all in action at one. Yet, for all the coolness, the short still treads water and I'm not giving anything away when I say that in the end all the pokémon have to work together to achieve a common goal. But, it's how they get there that makes this short stand out above the previous two. Once the short ends, the main feature, Spell of the Unkown, opens and we meet a little girl named Molly who's being read to from a children's book about ancient pokémon by her dad, Professor Spencer Hale. Their time together is cut short as an e-mail from Skylar comes through and the Professor has to depart for the desert where an important discovery has been made in a temple. The professor discovers a small square chip on the floor with a letter on it and soon finds an ancient container full of them. When he touches the contents the chips come to life and form a vortex which swallows him up into the world of the Unknown. Later, Skylar arrives and the bad news is delivered to Molly--that not only has her mother mysteriously disappeared, but now her father is gone as well. Leaving her all alone in the world. As she goes through her dad's personal affects that were shipped back, she opens the box of chips her dad discovered and spells out a message with the characters. Then message unleashes the Unknown on the world which transforms her mansion into a majestic tower of ice and then, the mysterious pokémon known as Entai appears and takes the place of her father. That's just the set-up before our hero's come on the scene as the Johto Journey's theme plays while Ash battles the trainer known as Lisa. And Brock will be Brock as he chases after Lisa in only the way he can. It's nice to see him back because I really like Brock's character for how he keeps things real. Alright, after the opening, our heroes head to Green Field only to find it has been changed into an icy wasteland. And as word spreads of the strange happenings at Green Field, Professor Oak, Delia Ketchum (Ash's mom), Skylar, Officer Jenny, and Team Rocket appear on the scene to see just what's going on. There's just one problem... Molly wants a mommy. There you have it, a great set-up. As I said earlier, what makes this movie shine is the fact that it stays true to it's roots and gives the fans of the series what they want while keeping you entertained. Sure, it doesn't have Ash saving the world, but it does have him showing off just how cool a trainer he is while giving equal props to Misty and Brock in some of the coolest battles they've had in a long time. Side note: is it just me or did one of the outfits Molly is wearing look just a bit too much like Rinoa's outfit from Final Fantasy VIII? What about the animation? Compared to the first two movies, this movie is absolutely stunning in terms of color pallet and use of non-obtrusive CG to make for a solid picture throughout. I did, however, notice some very jarring scene cuts in the middle of the movie. But, that aside, where the movie really comes together is in the sound department. Where the past two movies have been overt in their attempts to sell a soundtrack, this movie lacks that and in my opinion it's as close to the original that the domestic market will ever see. And it's always reassuring when the dub cast is still doing things right and sticking together because I've always enjoyed the work that the cast has done on the series. For haters of past Pokémon movie songs, there are only two songs throughout the movie, the opening theme song and the ending credits song ‘To Known The Unknown.' And these songs aren't over the top either. They fit the mood of the series. And in my book that's what's best. Oh, and I just have to say that the underwater music played while Misty is having her pokémon battle is one of the coolest numbers in the whole series. So, all in all is the movie worth it? From both an otaku and a Pokémon fan, definitely!